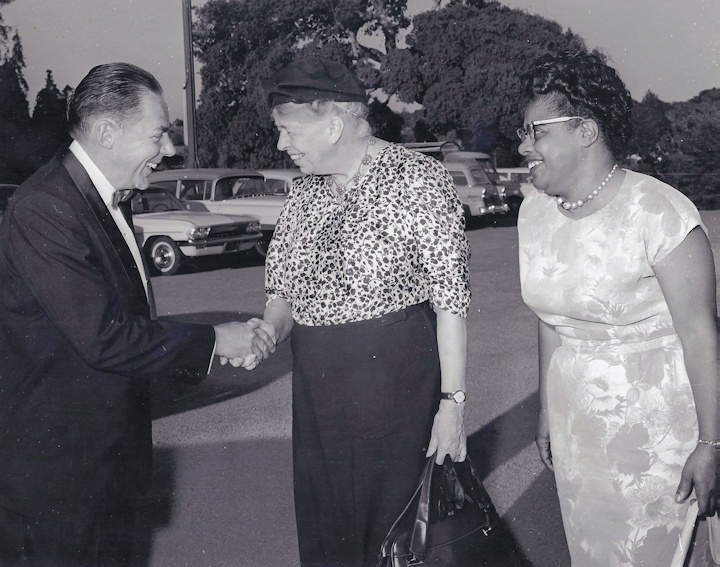 ELEANOR ROOSEVELT VISITS SANTA CRUZ. April 26, 1962. Now there was a genuine “First Lady”. That’s Santa Cruz mayor Bert Snyder she’s shaking hands with. Erva Bowen is to Eleanor’s right. She was an early activist here and president of the NAACP. Read Erva’s obit in The Santa Cruz Sentinel, February 2011. Very impressive. SANTA CRUZ’S MYSTERY SPOT. You haven’t been there in years…admit it. Here’s a recent tour. 12 SCARY PLACES NOT TO VISIT. I think some of this is hype but check it out. 7 AMUSEMENT PARK DISASTERS CAUGHT ON CAMERA. Only a bit grisly…but we can’t be too careful. THE WHARF FROM A TOURIST’S POINT OF VIEW. I’m not even sure what language this is, but check out the end of the wharf…nobody ever films that part. WE need to save it, tourists and locals love this adventure! re: Cabrillo Music Festival. The actual facts that are long hidden in the archives of time. 1962: I was the president of the Watsonville Concert Association, and had just put together an Art, Music and Wine Festival that was very successful. To raise money for a piano. I got the idea that I wanted to create a major music Festival much like Tanglewood or Carmel’s Bach Festival. I was singing in the Bach Festival at that time. November, 1962: At a Gala Affair at the Aptos Beach Inn I ran into Ted Toews, who was the new conductor of music at Cabrillo College. I was singing with him at that time. We talked. I told him of my dream. He said he was thinking about the same thing! The seed of an idea was fertilized and was given birth 9 months later! The Sticky Wicket and the Jowers were dead against it. They said it would compete with their weekend musical series. Bob Hughes was their director. As things progressed and it was becoming apparent that the Festival was happening and was supported by the community, they jumped aboard the bandwagon. At that time Bob Hughes was the “manager” of the Oakland Symphony under Gerhardt Samuels. Hughes involvement in the Festival came after Samuels was selected as the first Festival Conductor. Hughes did NOT create the Festival. Lou Harrison was dead set against it, too. He calligraphed a scathing letter to the editor of the Watsonville Pajaronian tearing apart every aspect of the Festival! Pajaronian editor Frank Orr gave me the letter after it was printed because it was so beautifully drafted. His basic reasoning was that the community didn’t even support its local artists, let alone a major and expensive Festival. Later he hopped onto the bandwagon when he saw that it was a successful reality. The first festival cost $15,000 !!!! Another unsung hero involved in creating the Festival was Jerry Barnes. He was responsible for raising the pledges for the $15,000. He was a Watsonville business man and friend. He went to 15 of his business friends, and somehow convinced them that the Festival was an investment. This took up all his time, and he lost his own business (agricultural broker), his marriage with 4 little kids was destroyed. He was so broke that he couldn’t afford to buy tickets to the festival. Mary and Ted Toews bought his tickets!!! The rest is history. ONE MORE FESTIVAL NOTE. Alyce Vestal (now Alyce Cadwallader) was married at that time to Pajaronian photographer Sam Vestal. Wikipedia says this about that…”In 1956 the Register-Pajaronian won the Pulitzer Prize for an investigative series by photographer Sam Vestal, working under the leadership of its longtime editor Frank Orr and with assistance of Watsonville Police Chief Frank Osmer. These revelations led to the resignation of Santa Cruz County District Attorney Charles Moore, and the arrest and conviction of one of his associates. “Two major high-rise apartment development sites in downtown San Jose have been sold to the same Chinese real estate giant that purchased San Jose’s Silvery Towers project in 2014”. Now we have to wonder if Swenson will sell the 94 units they are building on Pacific Avenue? “I guess the mission of NN is to make it easier for people to be informed and active citizens in our communities and in our republic. Part of being well informed is to be smart consumer of information, and that requires putting in the time and effort to absorb info from a variety of sources, to help correct for bias and to guard against falling into a silo or echo chamber. Once informed, the other part is to use that knowledge to work with our elected representatives to sustain and improve our communities, our states and the country as a whole. NN tries to reduce the friction, effort and time required to exercise one’s citizenship by making it one-click convenient to stay informed and to stay in touch with the electeds. Needful News is targeted towards the entire United States. Right now, the NN database of information sources is mostly filled in for California. Over time, I hope to bring more people on board and get the rest of the country into the database. (So far, I have several hundred hours of coding and data entry invested. I can’t wait to get some help…)” As I run across fun or quirky radio stations or publications, I’ve been using the NN Facebook page to share those discoveries and hopefully stimulate people into sampling more diverse information sources outside their normal orbit. I’m really encouraged by the quantity and quality of citizen websites out there, like BrattonOnline. The Internet and platforms such as WordPress have really lowered the barrier to entry for folks to participate more in the information ecology. In many ways, it’s an extension of the eighties and nineties when more people had access to printers and copiers, which was the golden age of ‘zines. With Needful News, I hope to make it easier for more eyeballs to encounter these sometimes hidden gems”. Do check out Chris’s Needful News and thank Chris when you see him and check it out regularly, it’s more than a labor of love …it’s a new necessity. It’s got links to local and worldwide sites we all need to know more about. GRAPEVINE NEWS. 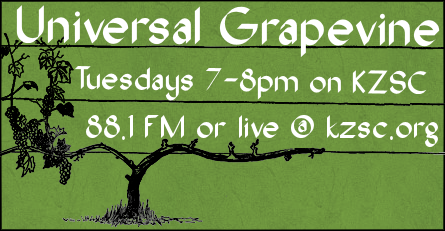 Last week (5/23) on Universal Grapevine two UCSC Students from Maria Astua’s writing class Robin Pama and Brandon Ayala brought up dozens of issues centered on the UC Campus wide strike on January 10. Issues and problems that were never focused on or publicized. Aside from teacher’s salaries being cut, dining hall workers fired before the summer months, bus problems, anti-union propaganda, they reported on something I’d never heard. That UCSC is classified as a UC RURAL campus…as contrasted to an UC URBAN campus. That means teachers, staff; anything associated with a RURAL campus is paid less. UC Merced is an URBAN campus by the way. Listen to their interview at KZSC.org for May 23. And if you know anything about this Rural/Urban thing let me know and I’ll pass it on. WHY KSCO??? It wasn’t all that long ago that liberals and Democrats in general refused to talk on or visit KSCO. The Zwerling family was and still is loyal and even ardent right wing Republican supporters. Now of course Michael Zwerling is a genuine Trump believer. To think station profits go that direction makes many wonder why some otherwise decent folk would help the Trump cause by appearing, some even regularly on that station. CONGRATULATIONS TIM FITZMAURICE AND LAURIE BROOKS. Tim Fitzmaurice is a former mayor of Santa Cruz. And besides that he even wrote an opera. Laurie Brooks was exec. dir .of The William James Foundation and the president of the Nonviolent Communication Organization. They got married the weekend before last. Details are hard to come by and send them best wishes by all means. GREAT HOUSING DEAL FOR SOMEBODY. (a repeat) Absolutely no response to this great housing deal I printed here last week….times must be as bad as they say!!! I have a good friend who is looking for a place to live somewhere near or here in Santa Cruz. He is a licensed plumber, carpenter, electrician, and painter. He and his wife are now commuting to their jobs here daily from Pacific Grove!!! A one bedroom or an ADU would be great and he’ll do all your ongoing necessary upkeep, repair work on your house, and of course pay a reasonable rent. Email me bratton@cruzio.com if you hear of anything and I’ll put you in touch. COMING ATTRACTIONS, CAR ADS & COCA COLA COMMERCIALS. I go to many more films than almost anybody. I asked around and yes it’s true…Regal 9 and The Riverfront run just about 25 (twenty five) minutes of previews and commercials before the main feature starts. The Del Mar and Nickelodeon run only 8-10 minutes. So now you can plan accordingly. A few facts are important since Santa Cruz City Planning staff carefully note any misinformation, which is then used to discredit the messenger. Not that they aren’t above spreading a bit of misinformation themselves. The most misleading statement from Planning staff is that the current zoning in the commercial areas along Mission, Soquel, Water and Ocean already allows for buildings up to 40 feet in height and most of the re-zoning is no higher. Only at certain areas called “nodes” will buildings be allowed to rise to 50 feet and 65 feet if certain criteria are met. This is true but misleading. Yes, current zoning allows for heights of 40 feet but what current commercial establishment wants or needs to go that high? The owners of Shoppers Corner, The Herb Room, Lighthouse Liquors, Charlie Hong Kong, Rio Theatre, Lillian’s, Omei Restaurant and others are unlikely to be seduced into tearing down their structures and building up to 40 feet for just a commercial interest. However, if the city re-zones their properties to allow 3 or 4 or 5 stories of housing on top of a commercial space then dollar signs start to light up. This has the innocent sounding name of mixed-use and that is at the heart of this re-zoning campaign. That will be the incentive for the property owners to tear down, go dense and high. There’s money in housing in case you haven’t noticed. Given that even the city acknowledges that property values rise with mixed-use it is unlikely that the former tenants which are the familiar establishments we know and love will be able to afford the new higher rents which opens the market up to chains and froufrou tenants. Prior to the Planning Commission’s recommendation to shift the highest density of mixed use from Soquel and Water to Mission by adding a 4th node to Mission, there were 3 nodes identified along Mission St. for intensified height and density (Bay and Mission; Almar and Mission; Laurel and Mission) but none was for the highest densities which in the city’s literature are reserved for “destinations” and Mission St. was specifically noted by the “stakeholders” as not a good destination since it is a state highway. Squirming their way out of the Eastside’s anger, commissioners apparently forgot to do their homework and staff obliged by failing to remind them of this fact. A subsequent discussion of the various forms of housing anticipated in these new high rises, led commissioners down the path to the desirability of co-living units. These it was explained have bedrooms and perhaps a bathroom and shared kitchens, ideal for students. If you have any hope remaining that somehow local workers and families will be housed via all this building, disabuse yourself. Nor will single-family homes currently rented to students suddenly become vacated. A single-family home rented to 6 or 8 students will always be cheaper than any of the proposed new housing. Nor will the building of 3000 new units on campus solve the problem since most of that building is in response to the current campus overcrowding. Sadly, the representative from Affordable Housing Now! used his time at the podium to lambaste opponents of the Corridors Plan. He lacked understanding of the gentrifying and displacement impacts of such mixed-use densities and lacked awareness of the hollow nature of the term “affordable” under the realities of the current housing market. Some increased density along major arteries is probably acceptable to most people. It’s a question of scale and impact both of which under the Corridors Plan are too large and guaranteed only to urbanize Santa Cruz without giving any relief to those who currently live and work here. Westsiders, it’s time to get involved unless you are prepared to be the losers in this struggle to save Santa Cruz. Tell me something I don’t already know. It’s why people still read newspapers, and magazines, and interesting blogs too. I was always fascinated by Alexander Cockburn’s weekly column in the Nation Magazine. He would usually tell three “man bites dog” stories of about 500-600 words each, and they almost always were about issues or people or places I’d never before heard about and never expected to hear about in the way he told it. Cockburn, who died in 2012, had a nose for the unusual and a way to hook people. E.B. White of the New Yorker was the same way, but less bitter and more sanguine than Cockburn. New York Times columnists, Maureen Dowd and Gail Collins usually tell me something I do not know, in an entertaining way too, much more interesting than the staid and often confused duo of moral upbraiding, David Brooks and Ross Douthat. I look for the Cockburn-White-Dowd-Collins columns because I know there’ll be something new to learn, and there’ll likely be an aha feelingto go along. I’ve always felt this way too about our local columnist, Bruce Bratton. Go to BrattonOnline if you want something new about local politics, often he asserts opinions that is not popular, and offers bits of Santa Cruz history you likely never heard before. Tell me something I don’t already know, Bratton has a long chapter in that book. Santa Cruz’s annual revenues collected this year are millions more than last year, but the city manager’s budget has us spending millions more this year, and beginning the year in a deficit mode. Why? The main culprit is what the city treasury dishes out in the way of public safety pensions—Police and Fire—and the deficits will be deeper every year until 2022, according to city finance director, Marcus Pimentel. And it will take more than a decade after 2022 to balance the city budget as current police officers and fire fighters will be retiring, and a lower tier pension system takes effect. The situation had gotten so out of hand that Gov. Jerry Brown in 2011 “challenged fellow Democrats to drink the political castor oil” and reign in public sector pensions. (LA Times article here) Lawmakers did approve reform in 2012, but not much real change in savings has occurred…yet. What I understand is that police officers in Santa Cruz, for example, retire at what’s called, “3% at 50.” This means they can retire as early as their fiftieth birthday and with up to 25 years of service, times three, they will be paid 75% of their best paid single year of service. Most other public sector employees, excluding fire fighters, receive 2% at 50, or less. What Brown’s pension legislation did was basically four-fold: 1) public safety retirement was moved from 50 to 57 years old, and for other public sector workers the shift was from 55 to 67; 2) retroactive pension increases are now prohibited; 3) vacation and sick time can no longer be used to increase one’s pension; and 4) the public safety sector must now contribute 2-4% of their pay towards retirement.I hope this is not boring because it’s these kinds of financial commitments that are making it more difficult for Santa Cruz to hold the line on increasing funding for social service programs.Interestingly, the hotel tax, for example,is at an all-time high–$12 million—but the city manager’s budget still recommends cuts to social services this year, mainly because of the current over-generous pension pay-outs. So, tell me something I don’t know. Okay. The Santa Cruz city council had its second 4-3 vote, and this time it was on a budget issue. Sandy Brown, Martine Watkins, David Tarrazas and Christopher Krohn voted to restore funding to the Neighborhood Childcare Center, Toddler Center, and the Foster Grandparents program, but not all of it. Councilmember Martine Watkins argued the cuts were too deep and led the charge to get these respected groups a bit more money. At the risk of beating a dead horse, this year’s city budget does not do well if we are to judge it by what we are spending on the most vulnerable in our community—children, the homeless, the mentally ill, the houseless, and those addicted to drugs and alcohol. In fact, the last several budgets since the “great recession,” as the city manager calls the almost regular hiccupping of the capitalist system, the most recent being from December of 2007 to June of 2009, have not been generous in funding social services. The city manager also says that taking care of the vulnerable is not necessarily a “core” service that our city should offer since other cities do not. Social services funding this year might hover a little over $2 million out of a $270 million-dollar total budget. That means that less than one-percent of the city budget supports programs for the most vulnerable in our community. That figure will likely rise in the next budget, but it will not get past 1%. Okay, say critics, it’s not fair to compare spending on the overall budget (I respectfully agree to disagree) because it includes restricted funds and “enterprise” funds like water, garbage and sewer fees that can only be spent on those services. So, it is fair they argue, to only look at the $98 million “General Fund,”on page seven of the current SC city budget (http://www.cityofsantacruz.com/home/showdocument?id=59794).That is,the council can spend this money on anything the council theoretically wants. This means the $2 million social services figure then becomes approximately 2.2% of the total general fund. Okay, for comparison let’s look at the three departments that draw the most from this “discretionary” general fund. The Police Department is by far the largest draw down at 28.5%, or $28 million. The Fire Department is next at $17.4 million, and Parks and Recreation is a bit over $15 million. And another huge area that we need to question is whether we are getting enough bang for our buck from the Planning Department and Economic Development, which combined account for another planned expenditure of over $10 million. Remember, the Community Services Program Committee staff person, Tina Schull, reported out to the council a couple of weeks ago that the city spent over $20 million on reacting to homelessness. My motion would be to take one-fourth of that reactive budget and make it active. Create a Homeless and Housing Services Department and begin with a down payment of $5 million, or simply take the $5 million and allow current Homeless Services Center staff to open a 24/7 year-round shelter with a plan for incorporating in mental health, drug, and alcohol counseling programming as well. We can do this. The general fund is discretionary. We have the resources in the city of Santa Cruz to confront our housing and homeless crisis head-on. And later we can pass a 3% hotel tax to capitalize the newly formed department so that it has a recurring budget. We throw in a tenant’s rights office too in order to protect renters—students, working families, and those transitioning out of homelessness. We can do this. It’s our time and maybe this is why we are here. I invite you to join the political debate and urge the city council set aside an additional $5 million to tackle these issues. Hell, it would still only be a paltry 5.4% of the general fund compared to Police at 28.5% (60% calls for service related to homelessness according to Chief Kevin Vogel), Fire Department at almost 18% (remember all those sirens we hear? ), and Parks & Recreation department (campsite “cleanups”) at around 16%. We can do this. More of what I learned being on the inside, and it may or may not be new to you readers, is that it is tough to confront the police chief on how much it costs to maintain his recently acquired BearCat tank, and what exactly would be the process for returning it to Homeland Security? And to the city manager, I want to know how do we begin the process for buying the Beach Flats Community Garden and keeping it a green space for the Beach Flats neighborhood in perpetuity? Also, how do you tell the police chief ‘no’ to three new full-time Community Services Officer positions until we have a 24/7 shelter up and running? How do you shift this $271 million aircraft carrier budget into the direction of necessary human service needs that include shelter, counseling, and housing? Call the city council at 420-5020 and let them know where you stand. 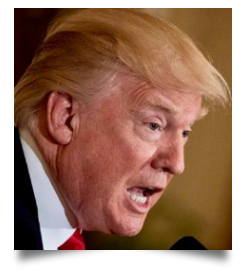 What did Donald Trump say recently…that he didn’t know how hard being President would be? Well, I kinda knew how hard being a councilmember would be because I did it before, but damn, it is still hard confronting our city’s historic power brokers—-think UCSC admin. and Regents, the police, the Boardwalk empire, and for-profit housing developers—-over the brick and mortar goodies that they have come to enjoy and rely upon. Where do you start these conversations if not at budget time? Please remember, time is running out. On the evening of Tuesday June 13th, the city council will approve a final budget for the city of Santa Cruz. Will it favor doing more for the homeless and the houseless in our community? Or will it continue to be reactive, like our healthcare system, and relegate the most vulnerable to an emergency room approach administered by city departments who are often not the best social service providers? ~(Chris Krohn is a father, writer, activist, former Santa Cruz City Councilmember (1998-2002) and Mayor (2001-2002). He’s been running the Environmental Studies Internship program at UC Santa Cruz for the past 12 years. He was elected last November to another 4-year term on the Santa Cruz City Council). The County Board of Supervisors will have two Special Meetings this week at the Hotel Paradox to interview possible replacements for Ms. Susan Mauriello’s job as “She Who Must Be Obeyed” aka, the County Administrative Officer (CAO). Friday, June 2, 8am and Saturday, June 3, 8am. According to material in the (one-page) agenda packets available on the Board’s calendar, THERE WILL BE OPEN PUBLIC COMMENT at each meeting. I hope you will attend and see who the six candidates are that Supervisor John Leopold says are being considered. I wonder how the initial number of 25 people, that number given me by County Counsel Mr. David Nefouse, got whittled down to six? Remember the $20,000 contract taxpayers paid with Peckham & McKenney, the head-hunter in Roseville, to recruit the CAO? Last Tuesday, as Item #23 of the Consent Agenda, the County Board of Supervisors approved a Technical Advisory Board to lead recruiting efforts for the County Administrative Officer (CAO) replacement. When I researched the supporting documentation, I was surprised to see that two of the six members are from outside Santa Cruz County. I looked into who the two out-of-county people are…. Matthew Hymel, recently made news in Marin County for refusing to license any medical marijuana dispensaries in the unincorporated areas of the county. The Board of Supervisors had passed an ordinance to allow four and directed Mr. Hymel to select them. After three community meetings, he chose not to license any of the 10 dispensaries who applied because of concerns the community raised regarding dispensaries in their neighborhoods. He wants to have a delivery-only system instead. Well, please do show up this Friday and Saturday, 8am at the Hotel Paradox, just next door to the County Building. I wonder how much money it will be costing us taxpayers to rent these three rooms and have catered food? I wonder why the interviews cannot be held at the County Building instead? Will the general public get to have coffee and donuts, too? Gee, I hope so. Find out how this year’s Smoke and Mirrors presentation will lead the public to believe the budget is balanced. How can a $8.1 million deficit be considered “balanced”? June 19: Parks, Land Use/Community Services, Captial Projects (supplemental budget TBD), Planning Department, Dept. Of Public Works. GEE…WOULDN’T IT BE NICE TO HAVE MORE EVENING MEETINGS FOR THE PUBLIC’S PARTICIPATION? #14: Approved $1.5 million to remodel the Animal Shelter. Wow. #15. Approved an agreement crafted to attract qualified and expert developers to enter into a deal with the County for an exclusive negotiation agreement on the Capitola Road & 16th mixed-use development. This will be three stories tall, with an exception to allow 40′ tall structures. APN 026-741-12,-13,-14,-15 on 3.7 acres. Written questions due by June 16, 2017. Watch out. Regular Agenda…here is a big one…#43 Authorized the County to go into debt $47,000,000 by selling Tax and Revenue Anticipation Notes, and also hired bond consultants for $67,000. Smoke and mirrors in action? Maybe that “anticipated revenue” is the reason behind the County making deals with developers like Barry Swenson Builder at the Aptos Village Project? Thanks to some very generous donors, I was able to scrape together the $1800 to appeal the Aptos Village Project amended Historic Preservation Plan approval by the Historic Resources Commission. Now it will go before the Board of Supervisors, with a CEQA consideration to evaluate significant new information and significant changes in circumstances that impact the Project. I asked for an evening hearing….do you suppose that will happen? A COMMERCIAL EVENT CENTER IN RURAL PLEASANT VALLEY? Well, once again, the County Planning Department is shoving through something that is not legal by their own Code definition. If you have ever traveled on the rural, narrow country lane of Pleasant Valley in Corralitos, you might wonder how the County could approve a large commercial event center to operate there that would allow 6 large events of 200 people and 16 small events of 50 people (who would be counting them?). Many of the people who live there could not believe it…if they were at all aware of the matter when it came before the Zoning Administrator last month. The appeal hearing before the Planning Commission will be June 14, 9 am in the Board Chambers (5th Floor). Maybe Planner Sheila McDaniel will explain why she reported the total traffic count for those approved large events of 200 guests was actually the number of cars for just the peak hour on the day of each event? Maybe she will explain why the number of parking spaces required for large events is based on that incorrect traffic count number? Maybe she will explain why the use by a large commercial event center that is not currently permitted in rural residential areas was approved? Hopefully, the Planning Commission will just say “No’ and the residents of Pleasant Valley will not have to constantly file complaints with the Sheriff in order to prevent EVEN MORE large events from being allowed at the event center within six months after start-up. We can only hope. Attend June 14 if you can….the local government needs to know that people are watching. IS THE SANTA CRUZ CITY PLANNING COMMISSION LISTENING TO THE PEOPLE? Last week, about 100 people filled the Santa Cruz City Council Chambers to testify before the Planning Commission regarding the “Corridor Plan” for dense, very high buildings along Mission, Ocean and Water Streets and Soquel Aveune. This means 5-7 story buildings. Nearly all those who spoke were against this type of development. An interesting article from almost 9 YEARS ago, in the Santa Cruz Metro Newspaper discussed similarly the public outcry against such dense, multi-story development during the General Plan update. “Last Thursday (7/24/2008) wasn’t the first time this tension had come up. Planner Ken Thomas explained that at the outset of the general plan process, more areas were actually considered for high-density development. After numerous meetings and vigorous debate, the areas were scaled back to major transit corridors, such as Soquel Avenue and Mission Street, explained Thomas. “Our goal is to preserve neighborhoods and enhance corridors.” he said. The Planning Commission back then was quick to assure concerned residents “that the city’s history as a cozy beachside town wouldn’t be forgotten. Commissioner Mari Tustin promised to keep the character of each individual neighborhood in mind while finding ways to use scarce land wisely. “The city is made up of all these small areas,” she said. “So we have to be careful that we don’t forget those little neighborhoods, EVEN AS WE DO WHAT WE HAVE TO DO.” (Caps added for emphasis.) Santa Cruz Metro, July 30-August 6, 2008, Page 7. Well, it seems the current Planning Commission has forgotten those neighborhoods and promises, and just continue to have more “Community Input Workshops” where people are divided up into small groups, their ideas dutifully written on white boards and large tablets, and made to feel that their concerns and ideas will be honored. In reality, that is NOT how the plans get made….developments, such as the Aptos Village Project, the Pleasure Point development, the area near the Harbor, the Capitola Road & 16th development, the downtown Santa Cruz area and others get developed in a manner that is decided primarily by the DEVELOPERS to maximize their profits, while the local governments get density bonuses from AMBAG and the State. The local governments have community input workshops only to be able to “check off the box” that the process was followed and to claim there is community support for the projects. The local governments often hire expensive consultants and facilitators, such as MIG, to bring in people who are skilled at manipulating comment and neutralizing those who vocally question the real intentions of the process and the real outcomes. And sadly, it seems the only way the people have a true voice is via expensive appeals and lawsuits. At last week’s Santa Cruz City Planning Commission meeting about the Corridor Plan, a local group announced the formation of “Save Santa Cruz” to fight back this type of dense, very tall development that seems to be steamrolling pervasively throughout this County (and beyond). Good work! It will be helpful that the effort is being initiated by two lawyers, Gary Patton and Jerry Christensen. It will be a worthwhile fight for anyone interested in preserving the quality of life in Santa Cruz County. Many thanks to those of you who contacted Bruce Walton and TRC Retail developers about the plan to remove all existing vegetation at the Rancho del Mar Center in Aptos. Mr. Walton stated that, pending an arborist evaluation, the large redwood tree near Ace Hardware will remain. Other trees will be removed “because they are diseased and require too much water,” he said. I was happy to hear there will be some areas of pavement replaced by pervious surface that will allow some groundwater recharge, and bio-swales will be included wherever possible. I encouraged Mr. Walton to contact the Resource Conservation District and County Environmental Health Department about getting grant money for groundwater recharge projects in the area. The State is giving away lots of money for these types of projects and we should not allow it all to go to Southern California interests. Let’s hope this project goes well for the Community…..keep asking for the theater/events center to be re-established. No construction timeline is yet available. CELEBRATE VILLA DE BRANCIFORTE DAYS ON JULY 22! Saturday, July 22 will mark the 220th year anniversary of the Villa de Branciforte establishment. Citizens are working with the Villa de Branciforte Preservation Society to honor the date with a public celebration at the Branciforte Small Schools Campus, on the corner of Branciforte and Water Street. A student at the Campus, Ms. Bria Steinbruner, is leading a student landscape project to beautify and highlight the significance of the location, which is currently marked by a plaque set in a stone monument. Join us for a Villa de Branciforte Fandango on July 22, 11am-3pm that will feature live music, dancers, food, educational talks and a walking tour of the area. Plan to enjoy this free family event to learn more about and honor California’s most significant coastal settlement. Last week’s San Jose Mercury News reported (5/24/2017, pg. B1) that in San Mateo, “A years long battle to save the beloved ice rink at Bridgepointe Shopping Center is finally over. Instead of pursuing plans to replace the facility with retail stores, SPR Holdings LLC, the owner of the shopping center, has signed a lease with San Mateo-based real estate developer Nazareth Enerprises to reopen the rink on Sept. 1. This is a dream come true not only for us but for thousands of kids and skaters who will be able to skate once again very soon,” said Save the Bridgepointe Rink Citizens Group leader Dina Artzt.” leader of the grass-roots effort. My personal vision is to see this sort of miracle happen in the Aptos Village Project for the bike jump kids and professional bike community. Think about it….the Phase II area of the Aptos Village Project being established for world-class bike jumps for all ages, and preserve parking for the hundreds of Nisene Marks State Park runners, walkers and cyclists who daily use the existing dirt parking area along Aptos Creek Road to meet friends and groups going into the Park. State Parks approves of the idea…there is not really any room inside the Park to accommodate more parking space. Rebuilding the world-class bike jumps would better satisfy the required active recreational space of the Aptos Village Project than will the vertical hillside that the County has accepted but has absolutely no idea what to do with. Think about it…do you think it could ever be possible that Barry Swenson Builders could have a change of heart and honor the community wishes and concerns? WRITE ONE LETTER. MAKE ONE CALL. MAKE A BIG DIFFERENCE. ~Cheers, Becky Steinbruner (Becky Steinbruner is a 30+ year resident of Aptos. She has fought for water, fire, emergency preparedness, and for road repair. She ran for Second District County Supervisor in 2016 on a shoestring and got nearly 20% of the votes). President Donald J. Trump spoke recently at this year’s commencement exercises at Liberty University. Among other things, he said, “In America, we don’t worship government; we worship God.” Click that link if you’d like to see a video that shows him making those remarks. At Liberty University, those remarks were quite well received. I have to give the president credit for being half right. In America, it is true that we don’t “worship government.” Worshipful deference to governmental officials (including the president) is the very opposite of what Americans have historically believed is the right relationship between the people and those whom they select to work on their behalf within the government. However, the president is definitely half wrong, too, in his statement to the graduates. In America, it is emphatically NOT the case that “we worship God.” You might worship God. I might worship God, but “we” (that collective group of us) do not worship God. If you want to worship God, great! If I want to worship God, great. If anyone in the United States wants to worship God, and in any way they seek to do so, great! But is there any obligation to worship God? Can the government make that a test of what it means to be an American? No! Let me suggest our president do some remedial reading. He could start with the Constitution. Our current president often acts like he thinks he should be given some kind of special deference (you could call it “worship”) just because he is the president. And now he is suggesting that “we,” all of us, are part of some sort of national worship circle, just because we live in the United States. Wrong on the first count. The president gets no special deference. Wrong on the second count, too: We don’t worship God. And we don’t worship government, either! CLASSICAL DeCINZO. 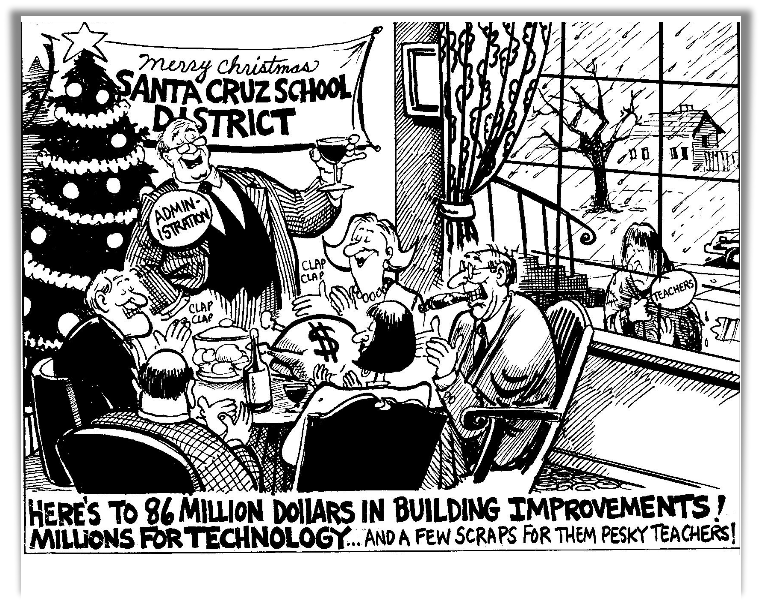 Check out DeCinzo’s view of our Santa Cruz School budget…roll down a few pages. EAGAN’S DEEP COVER. See another of Eagan’s “Classic Subconscious Comics ” down a few pages. Tim’s been vacationing in Spain… As always, at TimEagan.com you will find his most recent Deep Cover, the latest installment from the archives of Subconscious Comics, and the ever entertaining Eaganblog. CABRILLO FESTIVAL OF CONTEMPORARY MUSIC…GETTING EXCITING!! This is a big week and plenty of excitement for this year’s CabFestConMus ( formerly CabMuFest) They emailed…” One Week ’til Priority Seating Deadline! Orders are pouring in for Cristi’s inaugural season. Act now to reserve the best seats in the house. Go here to get tickets and programs. Also don’t forget about having a festival player guest in your spare room especially if you live near the Civic Auditorium.. Contact the festival if that’s possible. LISA JENSEN LINKS. Lisa writes: “While waiting for updates of my new book, let’s visit the Republic of Goodreads where old books go to be continually rediscovered, this week at Lisa Jensen Online Express (http://ljo-express.blogspot.com). Also, cheer on an intrepid band of Afro-Cuban musicians for one last hurrah in The Buena Vista Social Club: Adios, reviewed in this week’s Good Times.” Lisa has been writing film reviews and columns for Good Times since 1975. CHUCK. Live Schreiber and Elizabeth Moss (Mad Men) do excellent jobs in this film about a punchy Bayonne, New Jersey part time boxer. He’s a druggie, boozer, jerk, and completely unlikable mug and we aren’t told how or why he got that way. His big claim to fame is that he once knocked down Muhammad Ali who got right back up and beat the crap out of him. It’s a pretty good movie…but there are better things to do. BUENA VISTA SOCIAL CLUB “ADIOS”. Nowhere near as good as the first documentary that Wim Wenders directed. Most of the original Social Club died, the Club site has been totally changed and we learn that the original musicians got together for the first time just two days before they shot the world famous movie and resulted in that huge worldwide hit album. An amazing story, you’ll probably cry if you love their music at all. Go see it the music will still move you, and it adds to the “lure” of Cuba. THE LOVERS. Debra Winger is still great as she plays the cheating wife of a husband who is cheating too. Beyond that, the two people they are cheating with are also cheating. It gets a bit confusing and the slow times gives you a chance to think about all the lies you (or your “best friends forever” have told) told when they were cheating. Not for a first date evening but excellent for long time relationship people to see. BAYWATCH. It didn’t seem possible to make a movie that was worse than the original Baywatch tv show but they did. And as you’ve probably heard it’s one of the worst of the year so far. Dwayne “The Rock” Johnson is the only person you’ll even stay awake to watch…if that gives you any clue. Don’t ask what it’s about…its not about anything, trust me. PIRATES OF THE CARIBBEAN : DEAD MEN TELL NO TALES. The absolute bottom of the barrel in sequels. Even the dopey mugging by Johnny Depp (whose brother owned a bookstore in Santa Cruz) Javier Bardem, Geoffrey Rush and Orlando Bloom doesn’t save the lack of a story or plot. The effects are built for 3D but add to the confused and twisted story. Avoid this one like the plague. NORMAN. It has an 88 on Rotten Tomatoes, and for a quiet, serious, dramatic film that’s a very big deal. The full title is “Norman: The Moderate rise and tragic fall of a New York Fixer”. As the ads and reviews state, Richard Gere has never had a greater part and he’s never been better than he is in this saga of New York and money and Israel. Charlotte Gainsbourg, Steve Buscemi and Michael Sheen are equally wonderful. Gere plays a lonely, manipulative, well meaning guy who can’t help from making deals. He means well and will ultimately break your heart with empathy. See this film. A QUIET PASSION. This one got a 94 from Rotten Tomatoes,,,not from me. It’s part of poet Emily Dickinson’s life story. Emily is played by Cynthia Nixon and she’s wonderful. He’s hard to recognize but Keith Carradine plays her dad. (remember when his real dad John Carradine played at Cabrillo College’s Summer Theatre?). The entire film and everybody in it is stiff, cold, unemotional, and it feels like only a string of quotes strung together, with not a genuine human reaction to be seen…or felt. THEIR FINEST. Bill Nighy and Gemma Arterton lead off in this British semi-comedy set during WWII as England is being bombed while they are making a film trying to encourage the USA to enter the war. Jeremy Irons is in it for about 8 seconds. The film waves back and forth between drama and comedy. You won’t remember much of it afterwards, but it’s one of the best out and around at the moment. ALIEN:COVENANT. I looked up “covenant”because after the movie I had no idea how the word applied. it means.. to engage in or refrain from, a restriction, an agreed relationship. But never mind, this is of course another Ridley Scott chapter in his hugely successful Alien sequels. No big stars except Michael Fassbender (but he plays two roles!). There’s also Billy Crudup and Sam Waterston’s daughter Katherine in lead roles. For Alien fans and collectors there are plenty of original Alien reminders. There are also copies of 2001 touches, if you care. Actually it’s another space monster alive and killing in the space ship drama, OR will the space monster make it back to earth melodrama. It’s an exciting film. You’ve seen almost all of it before but if you do go see it, be very sure it’s in a theatre on a big screen. EVERYTHING, EVERYTHING. There’s not that separates this teen age Hallmark Greeting Card feel- good saga from the rest of the teeny muck cutesy flicks except the extreme cruelty of the girl’s mother. The acting is passable for a teen-age movie and all of the audience attending when I was there were teenagers. So go if you are a teenager, but any older than that….stay home or better yet go see Citizen Jane. KING ARTHUR: LEGEND OF THE SWORD. Jude Law is about the only good thing in this mess of a movie. It flopped miserably at the boxoffice…and it deserved it. Some tiny part of the Knights of the Round Table are in it, a little bit about Excalibur, one shot of the Lady In The Lake…and just about the dumbest, most convoluted plot you’ve ever not wanted to sit through. Huge FX transformer monsters race around stomping on things and people, and never mind the rest, just avoid this one like the plague.